/201812/181205 pinoy paskoIt’s December and Christmas is just around the corner. For Filipinos anywhere in the world, Christmas is a very special occasion. In the Philippines, when the calendar hits the “ber” months, it is not uncommon to see malls and shops starting to put up Christmas decorations and play Christmas tunes. Gulf News #Pinoy lists down some of the uniquely Filipino ways the festive season is celebrated. For Filipino Roman Catholics, Simbang Gabi is an integral part of Christmas celebration. In the Philippines, people wake up and attend the early morning mass for nine consecutive days until the 24th of December. Also called nine mornings, Filipinos believe that if they attend all the masses, your wish will be granted. During this time as well, food like puto and puto bumbong (type of steamed rice cake) are popular food items sold outside the church for people to eat after the mass. Lanterns hanging in windows and other areas is another common sight in most Filipino homes this time of the year. 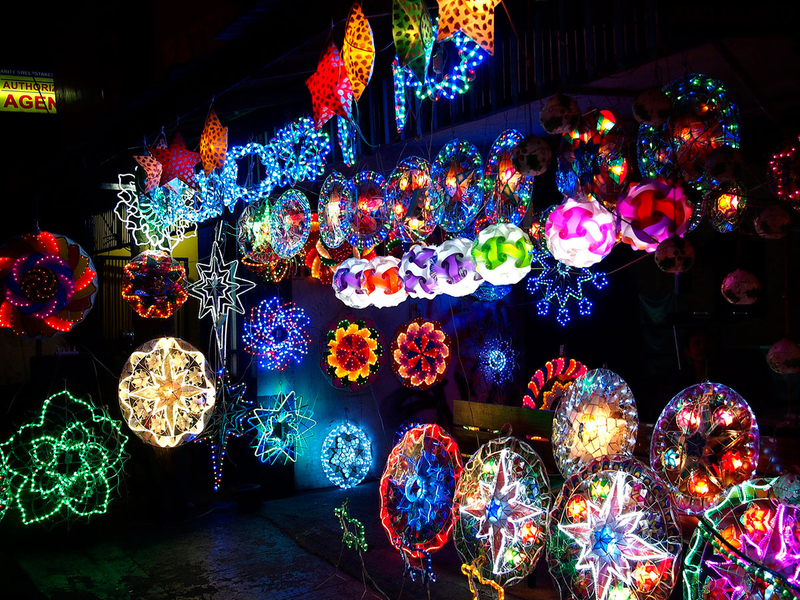 The Christmas lantern, or parol as it is called in the Philippines, is traditionally made out of bamboo and paper and comes in various sizes and shapes, but generally the basic star shape is the most common. The province of Pampanga is well-known for its parols and is also celebrated as the parol capital of the country. It is also common for schools and other establishments to organise parol-making competitions. The parol is a representation of the Star of Bethlehem that guided the Three Kings to the manager. For Filipinos, it also symbolises the victory of light over darkness and hope and goodwill during the festive season. As Filipinos are widely known music lovers, Christmas carols have also been part of the tradition of celebrating the season. Children and adults go from house to house in the neighbourhood singing Christmas carols. The group will sometimes use makeshift instruments such as tambourines that are made with aluminum bottle caps called tansan. After singing Christmas carols, home owners would usually hand out coins or gifts to the carolers. Apart from caroling, it is almost impossible to celebrate Christmas without hearing OPM Christmas songs being played almost everywhere. Some of the most enduring tunes are those by singers like Jose Mari Chan (Christmas In Our Hearts), Gary Valenciano (Pasko Na Sinta Ko) and Ariel Rivera (Sana Ngayong Pasko). Belén is another traditional Filipino Christmas symbolism. In Filipino homes, schools and in establishments, you can find the belén, or a tableau depicting the Nativity. The term is derived from the Spanish name for Bethlehem, and it shows the infant Jesus in a manger, surrounded by Mary, Joseph, the shepherds and their flock, the Magi and some stable animals. You can also see an angel or star or both. In some places, prizes are given to the best belen in the community. For Filipinos, Christmas is the best season for gift-giving. One of gift-giving traditions is the monito-monita. It’s basically an exchanging of gifts on the eve of Christmas day. Typically, weeks or days before Christmas eve, families or friends will pick names of their monito or monita. Another traditional way of gift-giving during the Christmas season in the Philippines is the Aguinaldo. It is interpreted as gift or money received from benefactors. The most common practice the giving gifts or money to children by their godparents. Aguinaldo is a Spanish word for bonus. Other ways of Aguinaldo are companies giving Christmas bonus or gift packs consisting of food items to their employees. It’s a tradition among many Filipinos that on Christmas Eve (Bisperas ng Pasko), families and friends gather for midnight mass or the Misa de Gallo (Spanish for “rooster’s mass) and then right after the mass, the most-awaited Noche Buena feast. Families, relatives and friends dine together and enjoy the traditional Filipino Christmas staple of queso de bola (a ball of cheese made of edam sealed in red paraffin wax), spaghetti/pasta, fruit salad, hamon (Christmas ham), roasted chicken, pancit (noodle), embutido, chocolates, cakes, ice cream and many other food items that Filipinos have come to associate with the Noche Buena. 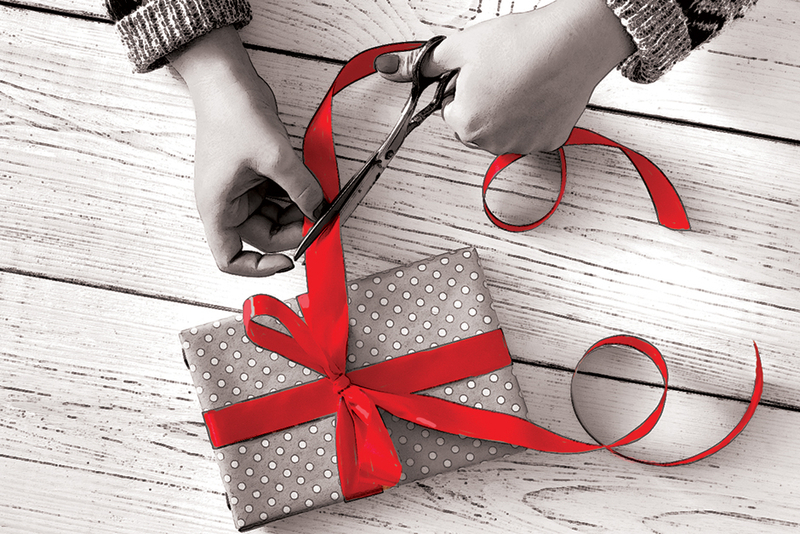 It is also the time of opening gifts from friends or loved ones. Christmas day on December 25 is a family affair for Filipinos around the world. Families and relative usually hold reunions that time as their loved ones from different parts of the country and around the world come home for Christmas. Many families gather for activities at home, while others celebrate it somewhere else like in malls or parks. For Overseas Filipino Workers in Dubai who can’t go home and celebrate Christmas in the Philippines, a Filipino community gathering is being organised. 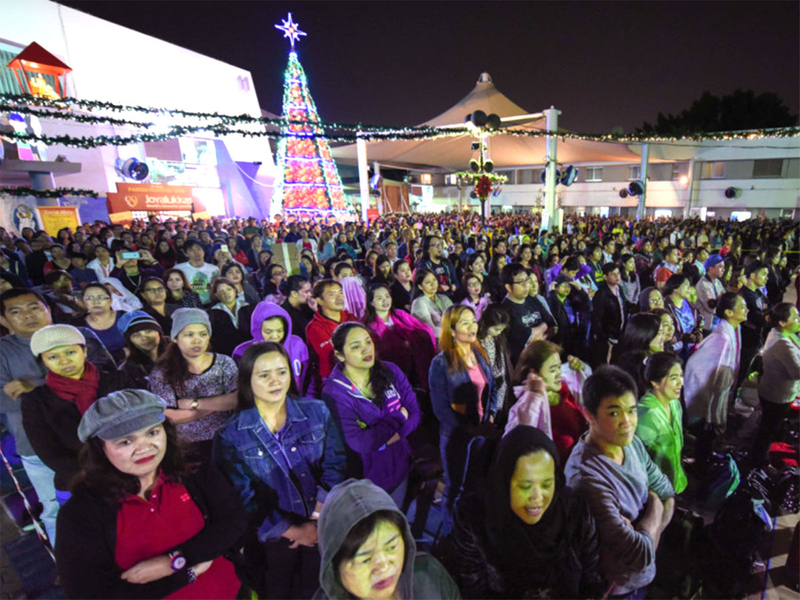 A free pre-Christmas celebration dubbed Pinoy Winter Festival is happening on December 7 (Friday) at Zabeel Park Amphitheatre from 9am to 9pm. Activities include parol making contest, Winter Festival lights, caroling contest, exchanging gifts and more. Filipino celebrities Mocha Uson, Mocha Girls and the Wishful 5 singers will also perform during the Pinoy Winter Festival.